12 Reproduction Maps $5 . 13 Early Postcards $1 . 14 Book "Civil War Monument" $10 . 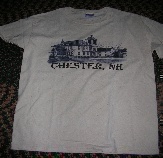 15 Chester Historical Society T-Shirts $5 . 17 Scarecrow Coffee Table Book $40.